1. You have to dream before your dreams can come true. 2.Look at the sky. We are not alone. The whole universe is friendly to us and conspires only to give the best to those who dream and work. 3. If a country is to be corruption free and become a nation of beautiful minds, I strongly feel there are three key societal members who can make a difference. They are the father, the mother and the teacher. 4. God, our Creator, has stored within our minds and personalities, great potential strength and ability. Prayer helps us tap and develop these powers. 5.To succeed in your mission, you must have single-minded devotion to your goal. 6. My message, especially to young people is to have courage to think differently, courage to invent, to travel the unexplored path, courage to discover the impossible and to conquer the problems and succeed. These are great qualities that they must work towards. This is my message to the young people. 7. Great dreams of great dreamers are always transcended. 8. When we tackle obstacles, we find hidden reserves of courage and resilience we did not know we had. And it is only when we are faced with failure do we realise that these resources were always there within us. We only need to find them and move on with our lives. 9. Let me define a leader. He must have vision and passion and not be afraid of any problem. Instead, he should know how to defeat it. Most importantly, he must work with integrity. 10. Excellence is a continuous process and not an accident. 11. Creativity is the key to success in the future, and primary education is where teachers can bring creativity in children at that level. 12. The world has today 546 nuclear plants generating electricity. Their experience is being continuously researched, and feedback should be provided to all. Nuclear scientists have to interact with the people of the nation, and academic institutions continuously update nuclear power generation technology and safety. 13. Climbing to the top demands strength, whether it is to the top of Mount Everest or to the top of your career. 14. Let us sacrifice our today so that our children can have a better tomorrow. 15. You see, God helps only people who work hard. That principle is very clear. Yes. The quotes are inspiring. Very true. His books ‘wings on fire’ and ‘ignited minds’ are so inspiring too. 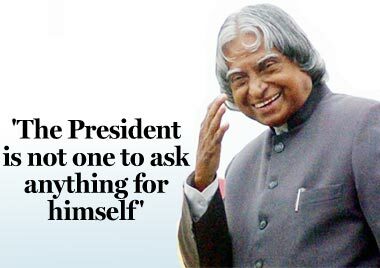 A scientist, teacher, inspirer, writer and above all people’s president. He will be missed 😦 But his fire is still alive in us.